The 1999 movies Fight Club and The Matrix both incorporated symbolic and/or informational ‘predictive programming’, which in a general sense simply means they included deliberate public displays of content which predictively communicated major future events; albeit retaining a cloak of plausible deniability through deliberate obfuscation, and/or non-specificity. Fight Club is a movie which contains an abundance of predictive esoteric information, which was custom designed to be complimentary with the September 11th 2001 Twin Towers false-flag terror attack, which occurred exactly two years after its first screening on September 10th 1999 at the Venice Film Festival. The Matrix contained a much more subtle informational insert; however, this single instance was contextually important enough to similarly link the actual event of September 11th 2001, to the overall themes of initiatory enlightenment and human control systems expressed in the trilogy. This series of posts are designed to be an in-depth esoteric and psychological examination of these connections – especially in the case of Fight Club and The Matrix franchise – but in doing so I will also make mention of Valley of the Dolls, Eye of the Devil, Rosemary’s Baby, V for Vendetta, Eyes Wide Shut, Ninth Gate, Black Swan, The Walk, the prescient and ever relevant insights in George Orwell’s novel Nineteen Eighty-Four, and unexpectedly the Back To The Future movies. The esoteric systems of Hermetic Kabbalah, Freemasonry, Neotantra, and Thelema, will be exposed as being central to the programming in these movies, as well as the September 11th 2001 World Trade Center false-flag attack, and a possible sister event involving the Mecca Clock Tower and Kaaba. The above twelve minute video by Apophenia Productions needs to be viewed in order for this post to be fully understood. This video came to my attention about a year ago, and reinforces my two year suspicion that the Sept 11th 2001 Twin Tower attacks are only one half of a New World Order ritual, and that the Mecca Clock Tower is a long planned sister event. The movie Back To The Future (1985) directed by Robert Zemeckis, and its sequel Back To The Future Part II (1989), contain unmistakable evidence of foreknowledge for a double-event ritual, over fifteen years before the first event occurred. As the above video reveals, the maker of this well produced expose has not realized that he has discovered evidence of a double-event, and instead believes that this blatant predictive programming is a synchromystical reference to the single Twin Towers attack, which in turn was a ‘synchromystical portal’ to awaken people in some kind of evolutionary initiation. In this post I will give another interpretation of the purpose of these esoteric symbolic inserts, because I favor a more conspiratorial interpretation of the motives behind predictive programming, though the concept of a world wide initiation ceremony is quite apropos (intentionally for malevolent luciferian and gnostic purposes, not benevolent ones). The above video is very well produced, and should be commended for the quality of its content and communications clarity. However, an earlier video by the same producer is shown below, because it illustrates something very important about the BTTF movies which is not explained so clearly in the newer version above. I have time-stamped the video viewer below to begin at the 9:20 mark. Make sure you watch the below video for two minutes until the 11:20 mark to see my point about the significance of two events, and how the newer video above did not so clearly develop this important aspect. The narrator in the older video aptly states: “But Marty has foreknowledge of two events“; referring to the Twin Pines Mall attack, and the Clock Tower being struck by lightning. 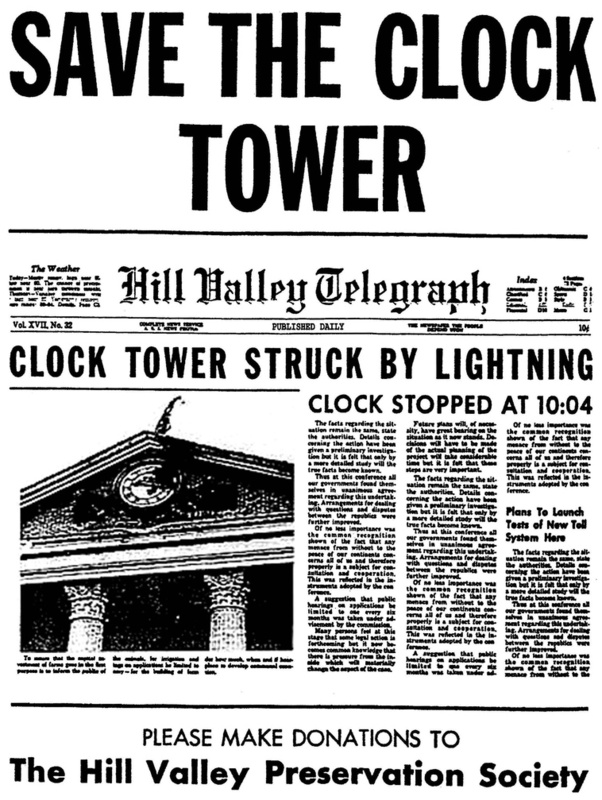 The first BTTF movie does indeed revolve around Marty’s knowledge of exactly two central plot events: A Clock Tower lightning strike in 1955, and an Islamic terror attack on Doctor Emmett Brown in 1985 at the Twin Pines Mall. As I have been exposing on this blog for nearly two years, the Sept 11th 2001 attack by ‘Binladen box-cutters’ (yeah, right), on the 7-towers of the Rockefeller initiated World Trade Center, was a geopolitical catalyst designed to unleash a worldwide Hegelian dialectic (Ordo Ab Chao), which is only completed once the reciprocal attack occurs involving the Saudi Binladen Group built 7-tower Abraj al-Bait complex (Mecca Clock Tower). This obvious worldwide ritual initiation into a New World Order initially using the Twin Temple Pillars, requires TWO EVENTS; one in the western world, and the other in the eastern world. I came to this conclusion early in 2014 whilst in deep thought over the ritual aspects of the Twin Towers, because from a geo-political point of view the Twin Towers and ‘Islam vs the West’ narrative, was extremely lacking in coherence. If the western oligarchy are to solidify their power with the Gulf Cooperation Council puppets they sponsor politically and militarily (Saudi, Qatar, Kuwait, U.A.E., Oman), in the key Middle East crude oil and natural gas fiefdoms, then a kind of MENA Caliphate needs to be catalyzed on the same scale as the European Union. This would obviously be an event that would require a pan-Islamic catastrophe. So I started looking for such a catalyst, obviously starting in Mecca with the Kaaba; the literal sacred center of Islam. It didn’t take me too long to notice the BIG Clock Tower, and also the fact that it was built by the Saudi Binladen Group. As the Illuminati Card Game cards (shown to the right) which were produced within a decade of the BTTF movies suggest, a COMBINED DISASTER is maybe on the cards (pardon the pun). This text is not relevant to the movie, but is relevant to the New World Order motives I have been outlining on this blog. After much research, I have found that these words are taken from an international address by Cordell Hull, the longest ever serving U.S. Secretary of State (11 year term). They are contained within a widely circulated press release 77 years ago, dated December 13th 1938, regarding the 8th Pan-American Conference; which was held at Lima, in Peru. As one of the worlds leading WWII era internationalists, Cordell Hull would go on to become the main architect of the United Nations, which as my readers will be aware, is a globalist order posing as a ‘peace’ organization, conceived during, and birthed after, the chaos that was WWII; which to its architects was the necessary chaos to conceive an embryonic World Government, which is what the United Nations strives to become after high levels of engineered global chaos allow one to be formed. The Imperialistic technocrats who secretly steer the United Nations, will not stop contriving major chaos until they get what they desire; the whole world! Cordell Hull is known as the ‘father of the United Nations’; a moniker that U.S. President Franklin Delano Roosevelt showered on him, and for this reason, Hull is one of the historical darlings of self proclaimed ‘progressives’ worldwide, who beg for an un-elected global technocracy to rule over them. As a ‘progressive’ Democratic Party apparatchik from Dixie frat land, Hull is remembered as one of the movers who placed President-for-life F.D.R. into the White House, and the point-man for the U.S. Income Tax (Internal Revenue Service), which is the enforcement arm of the usurious Wall Street dominated Federal Reserve System. The ‘Fed’ is a ‘legal’ fiat money cartel, technically referred to as a private/public hybrid; a super-quango with a monetary monopoly. This cartel, however, is actually totally private when we consider that T.B.T.F Fed Member Banks donate the largest amounts to the election campaigns of American politicians, or provide them with personal loans to fund their own campaigns; as in the recent, very cozy case of Senator Ted Cruz, and Goldman Sachs, which coincidentally is where wife Heidi also works as an executive. Cordell Hull, it needs to be known, was a complete racist (read his memoirs), and a globalist who attacked import tariffs and embraced ‘free trade’; which is code-speak for support of off-shore multi-national monopoly capital cartels, who are shacked up with the T.B.T.F. members of the Fed and BoE money cartel, all ruling over a commercial empire enforced at the expense of entrepreneurial domestic businesses – which get regulated and taxed out of existence. It should come as no surprise, therefore, that while in the halls of power, Cordell Hull was a very active Anglo-American Commercial Imperialist – posing as a “progressive” – who stated repeatedly that only ethnic European’s had the right to rule over other cultures (in an act of benevolence), and last, but not least, that the U.N. should be an agency to “prosecute war”, not to enforce peace; though the public relations people at the U.N., after its foundation, seemingly had a more pragmatic approach to branding. Presciently: “WAR IS PEACE”; as George Orwell aptly popularized. Winston Churchill had a similar view regarding a “world army” to “enforce peace”; so, dear reader, take a look at NATO, study Operation Gladio, and ask the question: “Who are the REAL global terrorists? … and who are their ‘useful idiot’ patsies?”. The Twin Towers and the Mecca Clock Tower attacks are the required worldwide ritual to consolidate the United Nations into a functional World Government – call it a christening – thus the appearance of the words of the author of the U.N. Charter on this flyer are important; especially the phrase “any menace from without to the peace”; which is the Hegelian modus operandi of the Imperial technocrats who run the United Nations from behind the vail of secrecy. This is the true reason for the Twin Towers & Mecca Clock Tower sister events: The deliberately nurtured enemy is ‘global terrorism’; the only victim is human freedom from an Imperial technocratic tyranny. This series will analyze and develop the meaning of the Back To The Future predictive programming explained in the above videos, by broadening the scope to include deep analysis of two other predictive programming projects; The Matrix Trilogy and Fight Club. I will also attempt to place these movies into their similar framework which revolves around elite psychology, and to develop a theory of this psychology using an aspect I label the Emmanuel Golstein Complex; derived from George Orwell’s novel Nineteen Eighty-Four. This novel will also be analyzed from the standpoint of elite psychology. I will also further develop some esoteric aspects of the symbolic architecture of the Twin Towers and Mecca Clock Tower, and explain how they will, and have been used, to create an initiatory liminal A∴A∴ ritual to manifest Aleister Crowley’s satanic Aeon of Horus. ― Anonymous; sometimes attributed to George Orwell without citation.